Stumbled upon this as available on Amazon Prime. There are so many Buster Keaton movies that I have never even heard of, it is ridiculous. I’ll give anything he is in a watch, no questions asked. SEVEN CHANCES is one of the really solid ones. I watched SEVEN CHANCES (1925) on 3.7.14. It was my first viewing of the film. Quick tangent to start. When I clicked on this movie, it started with the normal credits and title cards. 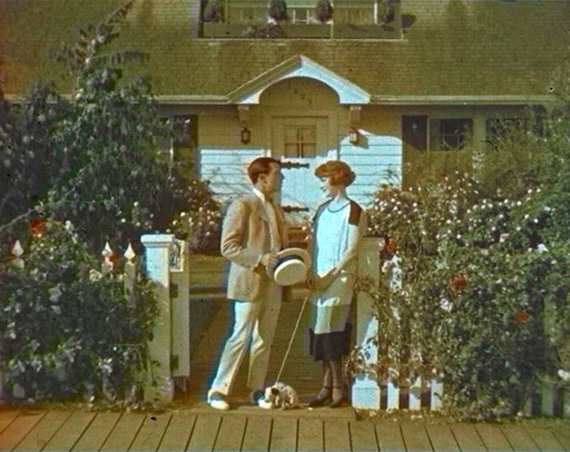 Then we see our leads, James Shannon (Buster Keaton) and His Girl (Ruth Dwyer) in color. I was pissed. How could Kino pawn this sort of thing off as legitimate? I got all pretentious in my anger about trying to use a color version of a Keaton silent film as the original. So I shut it off. Then I looked it up. Turns out, I am an idiot. The first few shots were made in Technicolor and are, in fact, what audiences saw in the theater. 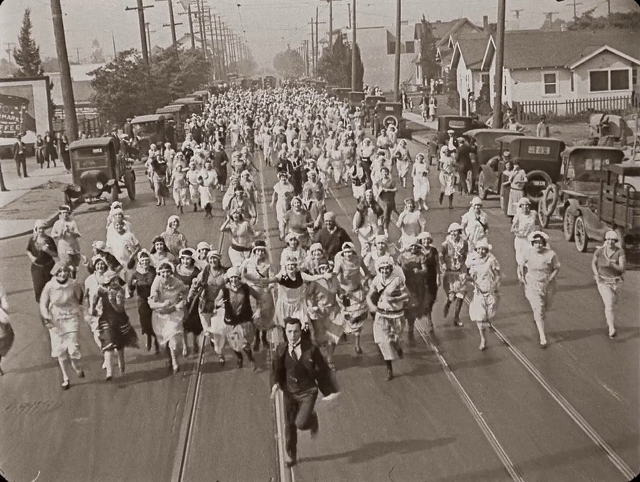 It quickly reverts to the standard look of a silent film. Anyway, SEVEN CHANCES has Keaton’s Shannon in a law firm which is about to tank. Suddenly, he learns that he will collect a seven million dollar inheritance as long as he is married on his 27th birthday which, it turns out, is that day. Fortunately, Shannon already has a girl he’s been wanting to marry for a long time. Unfortunately, he clumsily tells her that he can marry anyone, so why not her. She rejects him. She soon realizes she was too hard on him but, in true Keaton fashion, life gets in the way. The title refers to seven women that Keaton knows who he can ask to marry him. Those go wonderfully awry. The movie really starts, however, around halfway through when his business partner and his lawyer put an ad in the paper to meet Shannon at the church to be married that night for a shot at the money. The entire town of women shows up. A chase happens. Typical Keaton hilarity ensues. All turns out great in the end. Keaton (who also directed) is said to have hated this film. He found it too broad a comedy. Viewing it today, however, it turns out to be an excellent example of building gags. The first half of this movie is not physical comedy at all. The humor starts small and focused. As it rushes towards the climax, however, the physicality and the danger become bigger and more immediate. There are a few jaw-dropping physical beats in this film in line with anything in THE GENERAL. It would be remiss to avoid pointing out that the film doesn’t handle African Americans very gracefully. One character has shoes too large and is played as dumb. Another moment has Keaton about to ask a girl to marry him before realizing she is black. A less offensive moment has Keaton looking at himself in a mirror, turning away, and having a black man step where the mirror was. Keaton looks at ‘his reflection’ in shock and stumbles off. To call this movie racist would be harsh. To call it less than sensitive would certainly be valid. Despite that, however, this is just a wonderfully fun film. The filmmaking improves as the movie plows along, and it turns out to be some high-level stuff. The acting works, relying more on other people than many Keaton films do. A moment in a barber shop with Keaton trying to pull the head off a real woman is wonderful, but it needs the reaction of the woman to work. Another moment with Keaton trying to look at an ankle watch and seeing up a lady’s skirt is another such bit. The extras and day players in this really do help aid in the fun of the film. Not that I usually disregard any Keaton film, but this is definitely one to put on the list to see. It breezes by while also providing a glimpse into how Keaton builds comedy. Solid work. ~ by johnlink00 on March 7, 2014. Sounds fairly funny. Though the humor at the expense of black actors is probably going to deter me from seeing it. I know you wouldn’t quite call it racist, but even insensitive content has the likelihood of offending me. I think it is easier to compartmentalism the humor because a) the era it came from and b) the fact that it isn’t as bad as some of the film’s contemporaries.